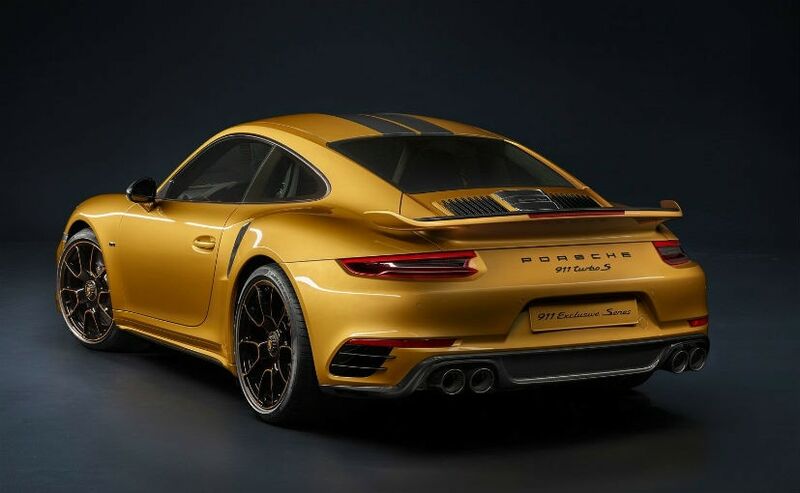 This Gold Porsche 911 Turbo S Exclusive Series Packs 598 bhp! Porsche has unveiled a new limited edition 911. And it is the most powerful production 911 Turbo S ever made! Oh and yes, it is painted in a rather lovely shade of Gold! 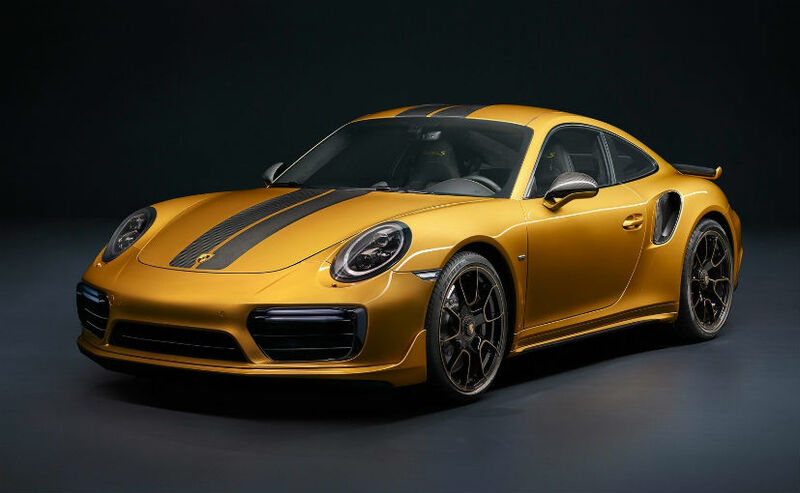 The new Porsche 911 Turbo S Exclusive Series from Porsche is limited to only 500 units worldwide and if you aren’t very excited about the golden paintjob, don’t worry, it is available in other colours as well. The Turbo S Exclusive Series features 27 more bhp than the standard car too along with a set of very distinct racing stripes. Incidentally, this power upgrade makes it the most powerful Turbo S that Porsche have ever produced. The new car also features more luxurious interiors as compared to the standard car. The new 911 Turbo S Exclusive Series is hand crafted at the new Porsche Exclusive Manufaktur at the headquarters in Zuffenhausen. The in-house customisation service offered by Porsche, previously known as ‘Porsche Exclusive’ offers special services to Porsche customers like bespoke interiors, special colour schemes. The Porsche 911 Turbo S Exclusive Series customers can also opt for a matching chronograph watch to match their car which has been designed by Porsche Design. Mechanically, the 911 Turbo S Exclusive Series has a 3.8-litre twin turbo flat-6 engine that makes 598 bhp and 750 Nm of torque that can propel the sportscar from 0-100 kmph in just 2.9 seconds and from 0-200 kmph in just 9.6 seconds. The Turbo S also gets carbon ceramic brakes as standard on this version and Porsche Active Suspension Management and Sport Chrono package as standard. The car also gets four wheel steering and Porsche Dynamic Chassis Control as standard. As we mentioned earlier, the 911 Turbo S Exclusive Series comes with a more luxurious interior. 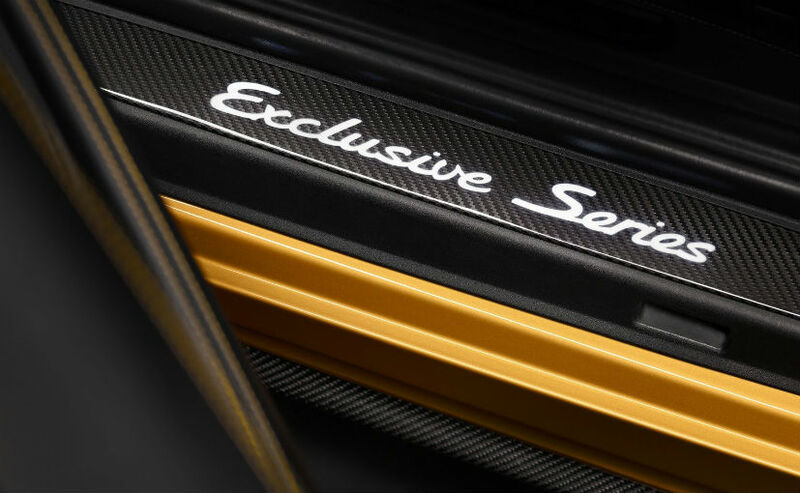 This includes seats covered with special perforated leather, alcantara roof lining and yellow highlights including a stripe and Turbo S lettering. The carbon fibre on the interior also has copper highlights and the carbon fibre door sills come with illuminated ‘Exclusive Series’ lettering.